Find hotel near St. Marys Syro-malabar Ca ..
Champakulam Kalloorkadu St. Mary’s Syro-Malabar Catholic Forane Church is an ancient church in Kerala. 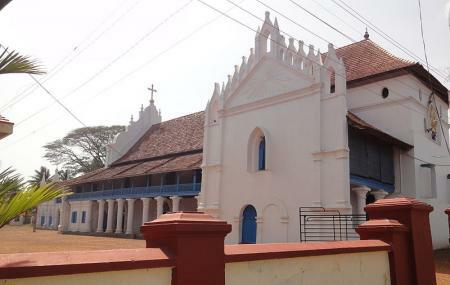 It belongs to the Syro- Malabar Church and is under the supervision of Changanacherry. This is the Mother Church of almost all Christian churches in Alleppey and is also called Champakulam Vallia Palli locally. It is believed to have been built in the early 5th century. This church has been broken down and built many a times. The rock inscription and the ancient cross here tells us all about its history and that it was last rebuilt in the 12th century and from then is standing strong here. How popular is St. Marys Syro-malabar Catholic Forane Church, Champakulam? People normally club together Mannarasala Temple and Ambalapuzha Shree Krishna Temple while planning their visit to St. Marys Syro-malabar Catholic Forane Church, Champakulam. I wasn't born or studied here in Champakulam, but this Church and the surrounding places are all dearest to me. This is a very old Church, known as the 'Portuguese Church', because long time ago they burned it. The inside is still preserved as it is. The ancient architecture of this Church gives us lots of relief from anaesthetic concrete churches. One of the very old and famous basilica in Kerala, Lot of devotees and tourist visiting this church, Water transport and road transport available for come to the church and situated near river. March 19th St Joseph feat lots of devotees visiting for blessing, still keeping old tradition. It is a historic and spiritual landmark, must watch in your trip in backwaters, Kerala.it is accessible by road and water route. It is built by a king a d it is one of the first churches built in kerala. It has tremendous art work on it's alter. It has 2 parish hall for recptions of various purposes. The view of the chair h is awesome.